The present chapter reviews vessel wall histology and summarizes relevant continuum mechanical concepts to study mechanics-induced tissue damage. As long as the accumulated damage does not trigger strain localizations, the standard nonpolar continuum mechanical framework is applicable. As an example, a damage model for collagenous tissue is discussed and used to predict collagen damage in the aneurysm wall at supra-physiologic loading. 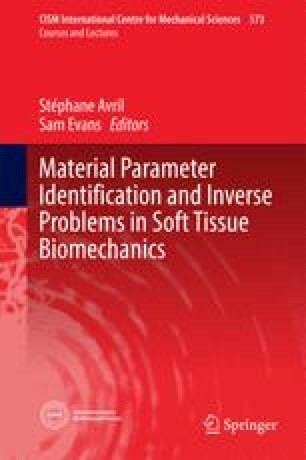 The physical meaning of model parameters allow their straight forward identification from independent mechanical and histological experimental data. In contrast, if damage accumulates until the material’s stiffness looses its strong ellipticity, more advanced continuum mechanical approaches are required. Specifically, modeling vascular failure by a fracture process zone is discussed, such that initialization and coalescence of micro-defects is mechanically represented by a phenomenological cohesive traction separation law. Failure of ventricular tissue due to deep penetration illustrates the applicability of the model. Besides appropriate continuum mechanical approaches, laboratory experiments that are sensitive to constitutive model parameters and ensure controlled failure propagation are crucial for a robust parameter identification of failure models. The author of this chapter would like to thank Andrii Grytsan, KTH Royal Institute of Technology, Stockholm for the valuable feed-back on the manuscript.